Monday evening I was at a local mall when I heard a band trying really really hard. Automatically annoyed when their music broke through into the bookstore, I then heard the Farhan Akhtar project, a band where the director turned vocalist while backed by Shankar-Ehsaan-Loy. It was pure cacophony as they 'rocked' songs like Dil chahta hai [Images] and Main hoon Don, frequently stopping the song to regroup and reestablish the beat with a hurried 'one-two-three-four.' All I can say is that they made me leave the mall way earlier than planned, and that if they had been on a stage on campus anywhere, they would have been booed off. Thankfully, they sound significantly better on CD. Socha hai opens with a distorted guitar wail, clearly inspired by the iconic beginning to Jimi Hendrix' take on The Star Spangled Banner. The track itself is a basic rock song with the kind of wannabe lyrics -- 'duniya mein hain jung kyon? Behta laal rang kyon?' -- straight out of a bad college band. 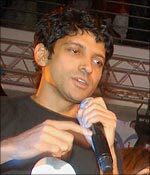 Farhan's voice is 'different', putting it politely, but it remains to be seen if he has actual range. And that 'yowza' tacked on to the end of the vocals is seriously a bit much. Next comes Pichle saat dinon mein, the na-na-na-na song from the trailers. This track has a nice tune, but the words this time -- talking of losing new shades, a denim jacket, a packet of marijuana -- are even more sophomoric. You might roll your eyes a few times at Farhan singing the word 'roya' as 'ro-yeah,' sure, but this is a track where his vocals actually work for the song. It's probably the 'hit' of the album, albeit the repetitive rhythm. With Rock On!, you kinda begin to get this vague Bollywood-rock genre. It's constructed like a standard Hindi movie song, but a few hyperactive guitars are thrown into the mix. I mean, you could take them out of this song and it would still work just the same. Akhtar gets ambitious with the vocals this time, and by now, you don't mind his voice as much. Hmm. Ye tumhari meri baatein lets Dominique Cerejo pick up the microphone, the composers wisely choosing her for the ballad. It's a really lazily written song, but the composition is top notch, moody and sad without getting maudlin. Cerejo hums-sings really well, though, making this an authentically good track -- this said without the indulgence the other songs demand. Oh lord. If that was refreshing, Zehreelay isn't. Suraj Jaggan weilds the mic with righteous anger, but the Rage Against The Movies feel is way too pronounced in this song that really really wants to sound furious. The words about snakes are vaguely interesting but Jaggan's too mad to actually enjoy them, and this attempt just shows you can't synthesize hard rock, not to speak of making it Bollywood-friendly. Tum [Images] Ho Toh is Farhan's turn at balladeering, and it's a blatantly mush-ridden song. I mean, what rocker worth his guitarstrap would sing 'if you're there the air is the colour of love'? Urk. Far too maudlin for this album, but one expects the film to provide this song with sufficient framing, cutting from one dejected rocker to another as we are told we should be sad. Sinbad the sailor is the most interesting track on the CD. Sung by Farhan and Raman Mahadevan, it shares the same vibe from the earlier 'rock' tracks but the vocals work well together, especially just before the chorus. And the lyrics finally seem genuinely fun. The penultimate track of the album claims to be a live version of Pichle Saat Dinon Mein, which basically gives Akhtar a chance at sing-with-me stage banter. This song works much better than the original, simply because a crowd loyally filling out a na-na-na-na-na chorus can't ever fail. (Okay, so the 'crowd' sounds oddly in tune. Hehe.) This has a nice feel, and while Farhan's opening enthusiasm is a bit harsh on the years, the song itself works -- at least till you start paying attention to the words. The single warm strings of one acoustic guitar accompany Caralisa Monteiro in Phir Dekhiye as she makes sweet love to the simple words. Monteiro is a very talented singer, and while this song is a well-plucked piece of anonymity, she rocks the vocals quite constantly and the words work wonders for it. All in all, this is a nothing album. The 'rock' tracks don't have the words or a true-blue feel, while the ballads don't seem like they belong on the same disc at all. The lyrics are pedestrian, and the only thing this album does is make you feel jealous of Farhan Akhtar. 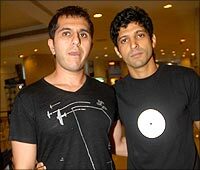 Man, I also want a buddy like Ritesh Sidhwani who backs me up enough to elevate bathroom singer fantasies onto a band film, stage and an actual album.